The lack of access to good quality, high resolution energy data of the statistical quality that most other disciplines would consider a pre-requisite for the pursuit of good science and robust conclusions. A limited capacity to analyse, organise or archive data, despite significant sums of money invested to collect data through individual projects. No basis for systematic reviews of research findings, and little basis for project-by-project learning, have resulted in limited impact of data on the policy process. Poor access to data makes it difficult to establish and maintain benchmarks for performance or to ground models. Practitioners have been left without usable guidelines, and policymakers without the tools to devise and evaluate policy. End Use Energy Demand research is hampered by a lack of good quality data, either because it doesn’t exist or it is difficult or impossible to access. CEEDS aims to address both issues by proposing the generation of new, high-quality datasets (e.g. a UK Energy Longitudinal Survey) and facilitating sharing of existing datasets. The Centre for Energy Epidemiology Data Service (CEEDS) aims to address these challenges by developing a holistic solution that will meet the needs of the research community across the energy demand sector. The primary function of CEEDS is not to manage data but to manage and share data knowledge. CEEDS is mostly concerned with end use energy demand data (including behavioural and social science data), while seeking to build partnerships with data resources in other disciplines. As there are many existing sources of aggregated energy statistics, CEEDS will primarily focus on micro-data at appropriate levels of granularity to facilitate meaningful study of end use energy demand behaviours. CEEDAR – a Data Asset Register logging relevant datasets with accompanying information and metadata (where available). Data Knowledge – Sharing data knowledge (e.g. best practices) is as important as sharing data itself. CEEDS will investigate enabling solutions such as data knowledge networks and open data journals. Data Advocacy – in a broad (across the sector) and specific (negotiating access to high value datasets) sense. Smart data – recognizing the potential for smart meter / smart grid data to be game changing for energy demand research. 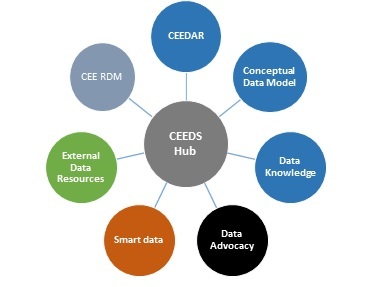 External data resources – CEEDS aims to collaborate with and encourage the utilization of the many valuable data resources that already exist or are being developed. CEE Research Data Management – CEE recognizes that it must first ensure that its own research projects conform to best practice in Research Data Management (RDM) and will develop relevant materials and protocols to facilitate this. Download the current version (Excel) of the CEE Data Asset Register (2017-08). CEEDAR was updated in as part of the SHED project in collaboration with UKDS. The CEE Bureau is a service designed to help people answer questions of complicated datasets, providing access to industry leading data analysis expertise, models and wider data curated and managed by the Centre. We can provide controlled and ethical access (see below) to sensitive datasets such as anonymised address and vehicle matched data, linking to other data sources to help better answer questions for academics, industry, consumer organisations and government in a cost effective way. Our in-house experts can also be utilised to undertake data analysis on particular datasets to answer more detailed questions. We also run a EUED-funded Visiting Researcher scheme that allows intensive on-site collaboration with Bureau staff (statisticians and data experts). The processing and management of data, including sensitive personal data, is a fundamental part of what we at CEE do, day-to-day. As such, we operate the highest standards of data security and ethical management of data. Our datasets are kept on secure systems and accessed only by named, authorised individuals who are trained in our data security protocols. We ensure that, where personal data is used, that we thoroughly anonymise any results before publication and otherwise handle data in strict accordance with the Data Protection Act. CEE was approached by PassivSystems to investigate the potential for energy cost savings if domestic customers were able to shift their energy demand for energy intensive activities (e.g. using a washing machine or dishwasher) earlier or later, and access tariffs that reflected the half-hourly variations in the wholesale electricity market. CEE data scientists utilised large datasets on domestic energy consumption and half-hourly energy prices and carried out a detailed analysis as part of the Bureau service. This analysis suggested that consumers could potentially save up to £33 per year on their electricity bills if they could shift demand and have access to half-hourly tariffs. For any queries, contact Simon Elam, CEE Data Manager.